These handmade custom connectors are made in the USA. Each connector has 8 inches of flexible, 30AWG, red and black wires attached with a molded epoxy strain relief. The pin pitch is only 50 thousandths of an inch (0.05in or 1.27mm). The small size makes them perfect for HO battery car installations. The small socket can fit into a small rectangular hole cut into the bulkhead or end of an HO flatcar. Each connector is sold separately. 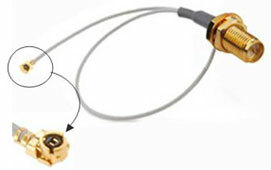 Has 6 inches of miniature coaxial cable with a U.FL plug one end and a REVSMA jack at the other end. The U.FL plug matches the new G3 decoder or the CONVRTR with external antenna socket - G3X - or the CONVRTREX module. Use this cable to match between the decoder and in any reverse-SMA type plug equipped antenna such as our accessory antennas. Low profile "dome" antenna. Can be painted with non-metallic paint. The dome is attached to 9 inches of RG174 coax cable and plug. The plug is removed and the cable solders to the receiver board in place of the standard wire antenna. It allows for an external antenna to be placed on top of a car or locomotive for better, longer range reception. Includes prewired plug with 12 inches of attached red/black wire to allow easy hookup of the AUX lighting header found on Drop-In decoders. Easily add unique lighting effects for a truly custom look to your USA-Trains locomotives. 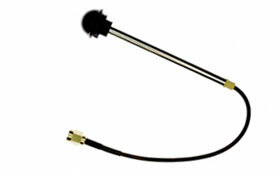 Includes prewired plug with 24 inches of 3-conductor wire to allow easy hookup of the Ditchlight header found on the USA-Trains SD40 Drop-In decoder. Just add your favorite white LEDs and enjoy the realism of working ditchlights. Matching socket for the CVP battery packs. Includes 18 inches of red and black stranded wire. Each wire is stripped and tinned on opposite end. Color coding and connector pinout match CVP's new BATT2 and BATT3 batteries which come with the plug already attached. Fits the battery charging jack on the bottom of the Drop-In decoder. 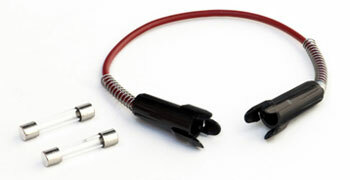 Right angle plug is 2.1mm ID and includes 24 inches of polarity coded wire with ends stripped and tinned. 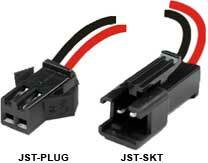 Includes in-line fuse holder with 18" wire leads, two 10A "slo-blo" fuses and hookup diagram. Provides catastrophic protection for the decoder wiring. Not required for Drop-In decoders. This is a general purpose switching power supply with an input voltage range from 90 to 240VAC 50/60 Hz. 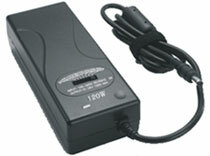 It is suitable for powering the Linker or any other accessory where a protected, regulated DC power supply is needed. There are 7 voltage settings selected by a slide switch: 12, 15, 16, 18, 19, 20, 24 volts. It also has a built-in USB charging jack. An external antenna will improve the operation of any AirWire decoder and is highly recommended for metal locomotive bodies. Each decoder includes appropriate connection points to replace the built-in antenna.